mobileWOMEN.org: Taking a Stab at an Unknown Sport - The Exciting Strategy of Wheelchair Fencing! 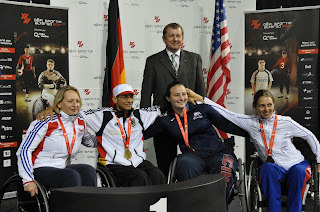 Taking a Stab at an Unknown Sport - The Exciting Strategy of Wheelchair Fencing! At age 27, Ellen Geddes is a fierce competitor, and after interviewing her before she headed off to Eger Hungary for the 2015 Wheelchair Fencing World Championships, I came away with that impression. A fast and athletic sport for sure, wheelchair fencing is as strategic as for those without disabilities, except for the fact that the wheelchairs are hooked into a frame so the competitors cannot move. Other than that, says Ms. Geddes, the blade work is the same. 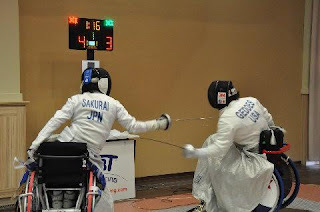 Getting introduced to the sport by chance, Ms. Geddes came to learn about Fencing after she was injured in a June 2011 car accident and now lives with a complete spinal cord injury level T-10. Upon her time in rehab in Atlanta, GA at the Shepherd Center, she was approached by the Shepherd Fencing Team Captain Dennis Aspy who was practicing at the same gym and asked her if she would like to hold a sword and stab some people. I guess one could say, Ms. Geddes was interested. So in 2012 she began her fencing career, qualified for her first Wheelchair World Championship Team, won her first medal in 2014 on the World Cup circuit in Montreal, and has not looked back. For this year’s competition in Hungary, which was held from September 16th through the 21st, Ms. Geddes traveled with one other female athlete and 3 men. During the competitions, the men would play men and the women would play women and more men than women do fence. “It’s a smaller sport than the group teams and there are more women now than when I started.” There are also two to three categories for the sport and depending on one’s level of ability, will determine the category one plays in. For people who can walk and have CP for example or live with amputations, these athletes would be in category A. For persons with disabilities who require the use of a wheelchair but have good arm function, would be in category B and for those with limited arm function would be in category C. Ms. Geddes who is in category B says she has always been an athlete and enjoys pushing herself to be better and progress in everything she does. And for her next big victory, Ms. Geddes hopes to qualify for the 2016 Paralympics in Rio. When asked how she felt about exposure for the winter Paralympics on TV, Ms. Geddes felt that exposure is always good but there needs to be people who have experience in explaining the events for winter and summer sports such as the complexity of fencing. To qualify for world events in fencing, one must go to different competitions to garner enough points to qualify. The wins are individually based for each athlete (not as a team) and will also rank the points in North and South American competitions as well. 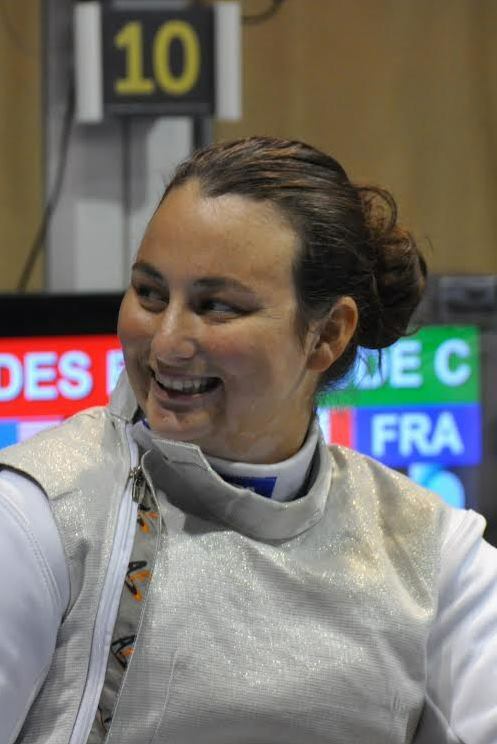 The three types of fencing events that occur, are Espee (Ms. Geddes is ranked at no. 1 in U.S.) and is French for sword, Foil (ranked at no. 5 in U.S.) and Sabre. 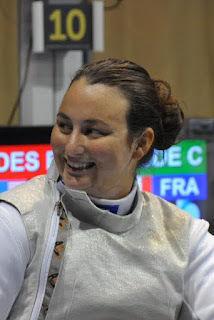 It’s interesting to note, that until recently women could only compete in Foil in which Ms. Geddes ranks 19th globally. It was fascinating to learn, that there are lots of fencing clubs throughout many U.S. states and that the U.S. Coach for the fencing team is willing to work with the state coaches to help them start their own local chapters or help people interested in joining a club. For Ms. Geddes she clearly will add her experience and passion to encourage future athletes who want to join. Currently, Ms. Geddes who lives in South Carolina, teaches horse-back-riding to middles school age girls at Maplewood Farms in which she is also the owner as well as instructor. She also has a Bachelor’s degree in religion and psychology from Presbyterian College.